Now here’s something you don’t see every day. 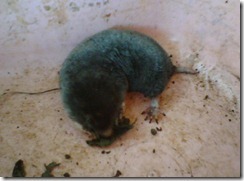 It’s a mole, about 6 inches long, sitting in a pink plastic tub, crunchy-munchin’ on a leaf. He’s been very diligently circumscribing a path of destruction around Mom & Dad’s front yard the past few days. Today, Dad spotted where he was digging, dug open his tunnel from above, and pulled him out. We relocated him in the orchards, outside of town. He’ll find better eating out there, anyway. Pretty cute, but you don’t want him making a salad bar out of your lawn. This entry was posted in animals, diversions by Kyle Kimberlin. Bookmark the permalink.